Not only that, you understand the Basic Principle of Investor Return which says, "the price you pay determines your rate of return." So all you have to do is take advantage of your expert knowledge and buy a great company at a great price. How do know a company's selling for a great price? You calculate its intrinsic value. In his 1938 publication "The Theory of Investment Value," John Burr Williams first articulated the idea of calculating a stock's intrinsic value. His idea essentially adds all of the expected future cash flows produced by a company and assigns them a present value. This present value represents the price you should pay. So, in financial circles, "intrinsic value" is defined as the present value of all expected future net cash flows to the company. Find that sentence a little hard to follow? That's why I prefer a definition that doesn't require a dictionary for interpretation. Intrinsic value is the actual value of a company as opposed to its current market price. That definition makes a lot more sense, doesn't it? So why is intrinsic value important? You can compare it to the current market price. If the current market price is higher, then you know the company is overvalued. But if the current market price is lower, then you know the company is undervalued. Knowing what's overvalued and what's undervalued is what separates successful stock market investors from the rest of the crowd. And buying low is the key to successful investing. Right? How do you calculate a company's intrinsic value? Does all that information look intimidating? Don't worry. We'll address how to easily find each piece of information soon. Fortunately, it's all on the Internet! Once you have all this information at your fingertips, you can easily calculate your company's intrinsic value by estimating its earnings for the next ten years. We'll address how to use this chart in moment. Before you can calculate a stock's intrinsic value, you need to know several pieces of information about the company and its stock. Current Stock Price - This one's easy. Just go to Yahoo! Finance or Google Finance or dozens of other places on the web where you can get real-time stock quotes. Plug in your company's stock ticker, and you've got it. Average Return on Equity - While most online services like Yahoo! Finance provide a figure for return-on-equity, it most likely represents the current year only. To get a more accurate number for your intrinsic value calculation, go to Google Finance, type in your company's ticker symbol, and find the text link titled "More ratios from Thomson Reuters." Follow that link, and you'll find a category titled "Management Effectiveness." Find the figure for "Return on Equity -5 yr. Avg." It's best to use a company's five- or ten-year average return on equity as opposed to a single year when calculating intrinsic value. Because a dramatically higher or lower one-year return on equity can throw off your entire calculation. So if you want the most accurate calculation possible, use a long-term average return on equity. In my opinion, The Value Line Investment Survey offers the best return on equity figures. Visit your local library, and you can find a company's return on equity every year for the last ten years as well as Value Line's projections for the company's ROE over the next five years. For best results, use Value Line figures for your intrinsic value calculations. Current Dividend Payout Ratio - Again, go to Google Finance, type in your company's ticker symbol, and find the text link titled "More ratios from Thomson Reuters." Follow that link, and you'll find a category titled "Dividends." Find the figure for "Payout Ratio (TTM)." That's the percentage of earnings your company pays out in dividends. Current Equity Per Share - Go to Yahoo! Finance, type in your company's ticker symbol, and find the text link titled "Key Statistics." Find the category titled "Balance Sheet," and find the figure for "Book Value per Share." This is the current equity per share, also known as book value. Current Earnings Per Share - Go to Yahoo! Finance, type in your company's ticker symbol, and find the figure for EPS. This is the earnings per share. However, keep in mind that Yahoo! Finance and most online services report a company's last four quarterly earnings figures as the EPS, so this figure might be distorted by a one-time expense or charge-off due to otherwise favorable long-term investments by the company. So make sure you perform due diligence when searching for an accurate earnings per share figure for your intrinsic value calculation. Again, The Value Line Investment Survey provides the most accurate figures. 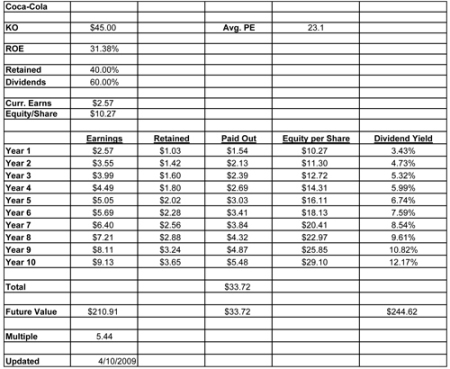 Average P/E Ratio - This isn't a ratio I?ve run across on Yahoo! Finance or Google Finance, so I performed a Google search to find a good site. A site called ADVFN popped up. If you follow this link to their site, and scroll down to the category "Valuation Ratios," you'll find a figure titled "5-Y Average P/E Ratio." This is the company's five-year average P/E ratio. But again, you can find a far more accurate ten-year P/E ratio by visiting your local library and consulting The Value Line Investment Survey. The figure they provide is the one I personally use. Once you've gathered all the necessary information, you can use Excel to calculate a stock's intrinsic value. Do all those spreadsheet formulas and calculations look confusing? Fortunately, I've already set them up for you! And you can use the exact same Excel spreadsheet I use for calculating a company's intrinsic value. Just replace the numbers in the yellow-highlighted cells with your company's numbers, and the spreadsheet will calculate a value titled "Multiple" on line 29. Line 29 is the calculation you're looking for. If your great company has a number above 5.00, it's currently undervalued. Because a multiple of 5.00 means you'll make a 5-fold return on your investment in the next ten years if you buy the company at its current price. A 5-fold return in ten years is a 17.46% annual compounding rate of return. Also, five is a nice round number, and I like nice round numbers. Think that's a silly reason for picking 5.00? Always keep in mind, calculating intrinsic value is an art, not an exact science. The spreadsheet's calculations act as a guide, not a precise road map. So a figure above 5.00 means you're approximately right. Remember, if achieved, a 5-fold return is a 17.46% annual compounding rate of return. This beats the S&P 500's fifty year track record of 10.85% by more than six points. Now, in order to make all your time and effort researching stocks a worthwhile endeavor, you need to beat the market by at least a couple of points per year. Over time, those couple of points will add up to a lot. You need to remember, calculating a stock's intrinsic value is an estimating tool. It's more art than exact science. So as a precaution, give yourself a little room for error. Tack an extra 25% onto that 4-fold return, and give yourself a new goal of a 5-fold return. That way, if you fall short of your goal, you still have a good shot at beating the market averages. So give yourself a little bit of leeway in case something goes wrong. In investment circles, this idea is known as the margin of safety. Benjamin Graham first put forth the idea of a margin of safety in his groundbreaking book Security Analysis (1934), which he co-authored with colleague David Dodd. "Confronted with a like challenge to distill the secret of sound investment into three words, we venture the following motto, Margin of Safety." So what's a margin of safety? It's nothing more than giving yourself a little room for error. Just ask yourself, "If things fail to go perfectly, will my investment still work out?" If not, there's no margin of safety. Then, you have a margin of safety. By purchasing only those stocks which offer a significant margin of safety, you limit your downside risk and significantly increase your odds of success. Learn how to calculate a stock's intrinsic value. It's a skill that will prove invaluable over the course of your investing lifetime. Use the spreadsheet located in the middle of this page. Look for companies with a multiple in excess of 5.00 at the current price. However, remain mindful of other variables. Some companies look like they're dirt cheap, and they are. These companies will make you a fortune if you're prudent enough to buy them. After all, if numbers told the entire story, no one would think about their investment decisions at all. We'd all just let computer programs "run the numbers" on our investments. Right?